This PDF 1.3 document has been generated by Word / Mac OS X 10.11.2 Quartz PDFContext, and has been sent on pdf-archive.com on 12/07/2016 at 15:03, from IP address 203.122.x.x. The current document download page has been viewed 1541 times. 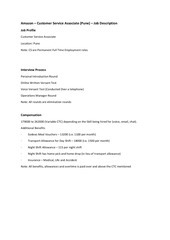 179000	to	262000	(Variable	CTC)	depending	on	the	Skill	being	hired	for	(voice,	email,	chat). This file has been shared by a user of PDF Archive. Document ID: 00399872.